The financial situation of local authorities is bad and is projected to get worse. After several years of working extremely hard to balance budgets and cut costs, it feels like this year’s budget round – for 19-20 and beyond – is throwing up more profound decisions than previously. The decisions will have more challenging consequences, which for many councils may affect the very survival of their organisation. As management consultants we observe and participate in hundreds of client meetings a month. To be blunt, many of these meetings are not good – they don’t meet basic requirements for structure and discipline. Too often there isn’t enough clarity about what the meeting is for (decision vs discussion), agendas can be woolly, and sometimes people aren’t clear whether a decision has been made or not. Obviously, good meeting discipline (which needs a separate article!) is a powerful enabler of good decision making. Over the past year I have become increasingly intrigued by the following question – is it possible to measure the quality of decisions made by local government? How are good decisions made, and what are the conditions necessary for that to happen? Can those conditions be improved? There are many tensions to manage – individual versus collective accountability, how you classify and understand risk, and crucially – who defines the problem we are trying to solve. Here it might be helpful to set out what I mean by a ‘good decision’. There is a consensus among experts that we should not measure the quality of a decision by the outcome. There are too many future uncertainties to factor in. So instead, we must focus on measuring the quality of the decision-making process. (Many elite sports teams refer to ‘executing our process’ as the basis of performance – with good results the consequence of a good process). You may recognise some of the characteristics on the left-hand side for your organisation – and hopefully recognise some from the right-hand side too. For budget setting processes in particular, the way these steps operate are entirely within the control of the senior leadership team. This mean that every local authority can control – and therefore improve – the processes which enhance the quality of decision making. Run well, good process steps do not have to take more time – indeed they may take less time because meetings are more productive, and the right preparation work has been done. But crucially, they will also be more likely to be decisions which stick – and are not picked apart down the track. One thing that many organisations lack the tolerance or patience for is getting the problem definition right. But this is the most important of all the steps. More than ever, this year better decisions are more crucial, and more consequential, than in the past 10 years for local government. 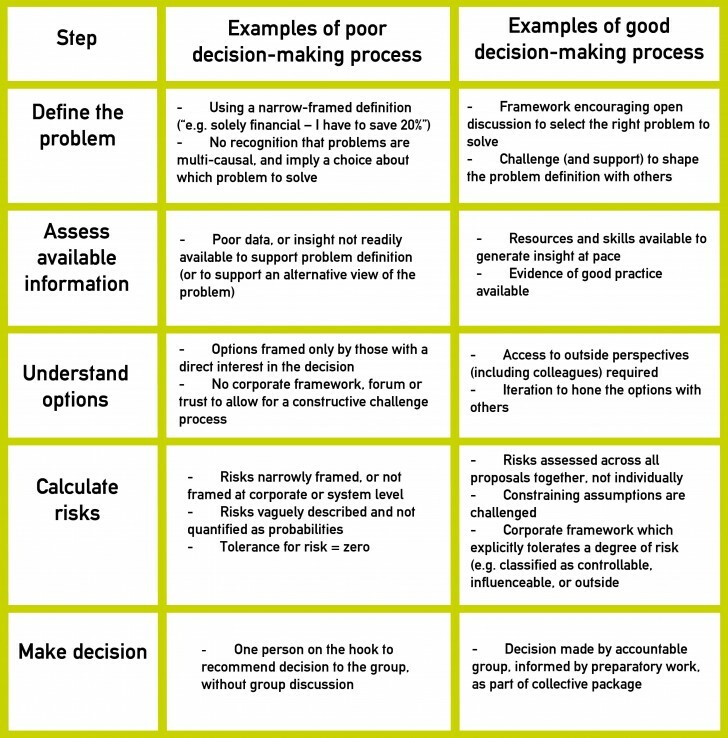 What could you do today to improve decision making in your organisation?